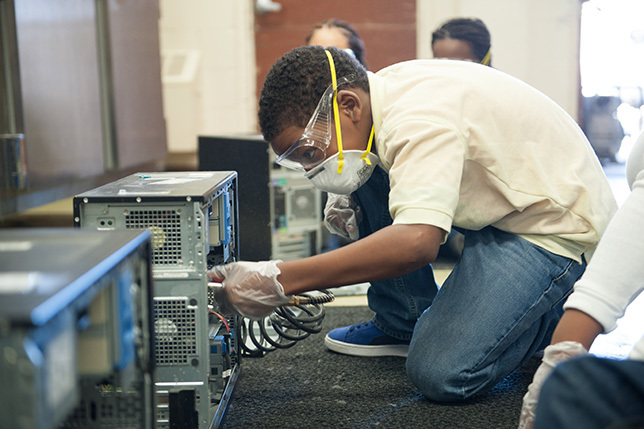 EduCycle recondition sessions bring in students ranging from 5th grade to high school, who gain computer skills as well as experience with time management and problem-solving. 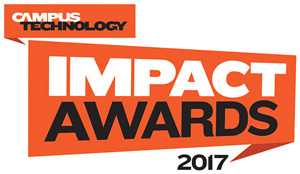 In 2013, Theresa Jenkins, manager of technology, facilities and events at Towson University (MD), noticed that her daughter was bypassing the library at her local public high school to use the computer lab at Towson because it allowed her to get her work done faster. The computers in the high school library were out of date. At the same time, Towson was facing a surplus of computers as a result of its rapid hardware refresh rates in classrooms and computer labs. Older PCs were relegated to storage or the refuse pile, wasting any remaining utility. Jenkins held a brainstorming session with Michael Bachman, director of client services, and they decided there had to be a better way. "Theresa had this idea about donating computers to Baltimore County Public Schools and I had an interest in getting the computers reconditioned because we were throwing away perfectly good computers," Bachman recalled. That was the origin story for what has become an innovative "EduCycle" Program to recondition and redeploy computers both on campus and in the community. The program also engages with community partners to provide experiential learning opportunities to young adults and underserved communities. Getting the program off the ground wasn't easy, Bachman admitted. "We needed space and people to do the work," he said. He and Jenkins held a kickoff meeting and invited people who might have resources to contribute. The Hussman Center for Adults with Autism on the Towson campus was looking for work placements for people with autism spectrum disorders, and offered EduCycle a space to work. Jenkins met with the person in charge of technology for Baltimore County Public Schools, and he was definitely interested in the university's older computers. Also, the district was interested in having students do internships working on computer refurbishment. "So not only did we have a mechanism to get rid of our oldest computers, which were still new to Baltimore County Schools, but we had a way to store computers on our campus, too," Jenkins said. "We realized we could help save money for the university, give back to the community and focus on sustainability." A pilot program was started in fall 2013 to deploy some refurbished computers on campus, and by spring 2014, EduCycle had fully launched. Here is how it works: After computers have served in the classroom for three years, they are transferred to the EduCycle program's storage facility. Volunteers from community partners help recondition them by cleaning them thoroughly, running a hardware diagnostic and ensuring that all necessary components are present. Computers that are to be redeployed on campus are upgraded to the campus standard of 8GB of RAM and 256GB SSD. Any department on campus can submit a request for as many computers as it needs, and EduCycle provides them at no cost. Funding was an initial hurdle. The EduCycle program wasn't funded by the university, which made it impossible to perform any upgrades to the computers it redeployed. But the program's leaders eventually convinced the university's budget officer to reallocate funds earmarked for new computer purchases to the EduCycle Program. Now the costs associated with reconditioning are covered by the savings realized by reducing new computer purchases. The volunteers learn hands-on computer skills while also earning service-learning hours. Fifty-seven percent of work time is performed by interns and volunteers. Michael Scribner, classroom and computer lab technology coordinator, said the recondition sessions bring in students ranging from 5th grade to high school, as well as adults with autism ranging in age from 18 to 22. After a 20-minute walkthrough of the refurbishment process, students dive right in, he said. "We work with them, but it is less about us swooping in and doing things for them and more about the learning experience for them. They are learning some basic diagnostic skills for the computers and they are also learning time management and problem-solving. That skill set is adaptable across disciplines. We find that a valuable outcome." 1,368 computers donated to area schools. That is not to mention the computers kept out of the waste stream. Each year millions of tons of electronic waste are improperly disposed of in landfills, allowing toxins to enter the soil and water supplies. According to the Green Electronics Council, a nonprofit in Portland, OR focused on green computing, only 30 to 40 percent of e-waste actually gets recycled. Towson's "Sustainable Materials Management" approach to e-waste aligns with the EPA's National Strategy for Electronic Stewardship, fostering the conservation of rare earth metals and reducing environmental impacts accrued during the life of a product. Julie Leary, Towson's associate director of client services, mentioned that the program has diverted 20,355 pounds of e-waste to date. An EduCycle committee develops new ideas and partnerships. It would like to expand donations to additional area public schools, and possibly public libraries, while continuing the mission of meeting technology needs on campus. The Towson executives believe their project is replicable by other schools of all sizes that may be retiring computers from the classroom before the end of their operational lifespan. They have developed documentation and presented at several conferences, both regional and nationwide, to share their story. "Once people see it, they start asking if it can work on their campus," Bachman said. "It starts with a passion about the idea that you don't just throw things away every three years and get a new one. You can get extended life out of PCs and still have happy faculty and staff using computers better than the ones they had." At a time when state funding is tight, the program is having a financial impact. "We are maximizing our use of state dollars," Jenkins stressed. "By not buying so many new computers, we can use that money to do something to help students instead of constantly putting it into buying technology."